A few days ago, I came across the phrase, while surfing the Internet, “the extended quadrilateral has six vertices.” Not understanding this, I researched the matter, and found out what this phrase means. If the normal four vertices of a quadrilateral are placed such that the quadrilateral has no parallel sides, then two additional vertices are created when the four sides are extended as lines, as shown below. 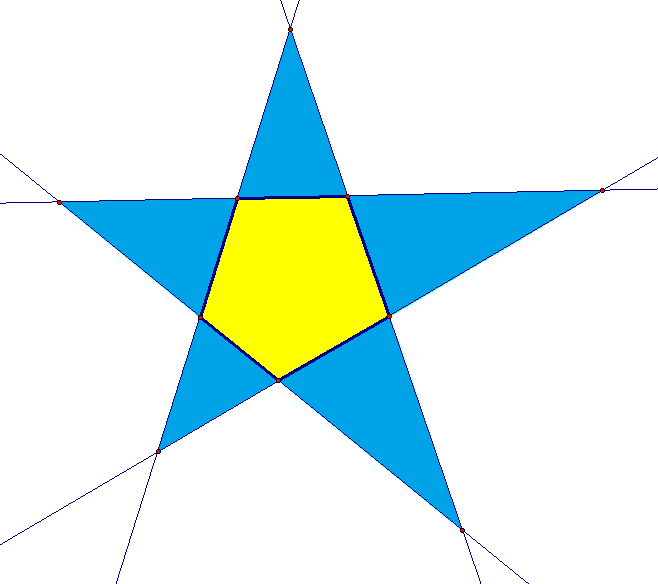 This gives a total of six vertices for this extended quadrilateral. Of course, one need not position the vertices in this way. Trapezoids, by definition, have one pair of parallel sides. 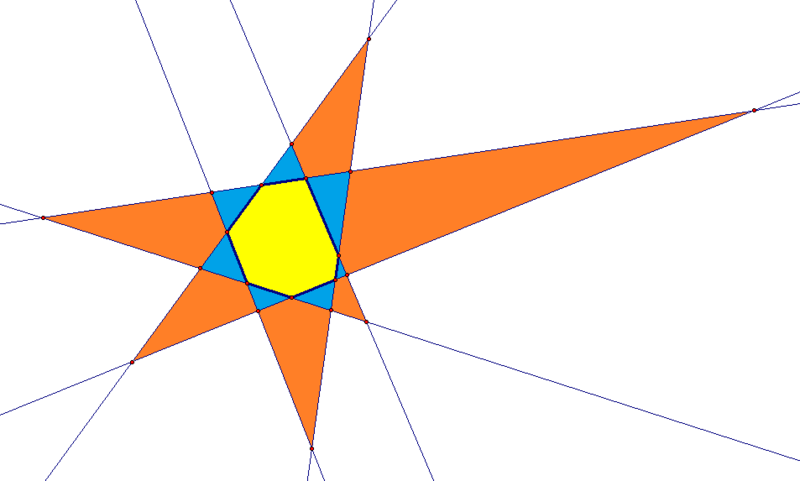 The non-parallel sides of an extended trapezoid still intersect outside this quadrilateral, creating a five-vertex situation. The other option is the parallelogram, with two pairs of parallel sides. This eliminates additional vertices altogether, so there are only four. This exhausts the possibilities, so the possible numbers of vertices for extended quadrilaterals are 4, 5, and 6. Realizing this, of course, just raises other questions: what about other extended convex polygons? 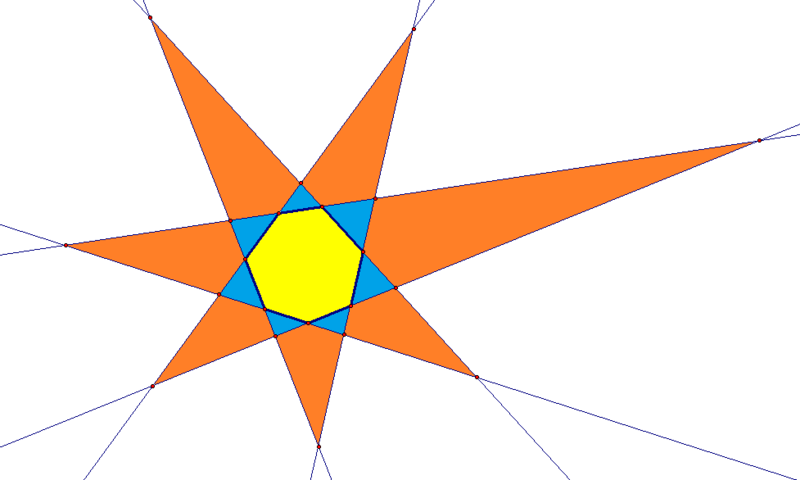 What are the numbers of possible intersections for such polygons with varying numbers of sides? Is there a pattern? To investigate this, I needed data, and started by taking a step back from quadrilaterals, to briefly consider extended triangles. 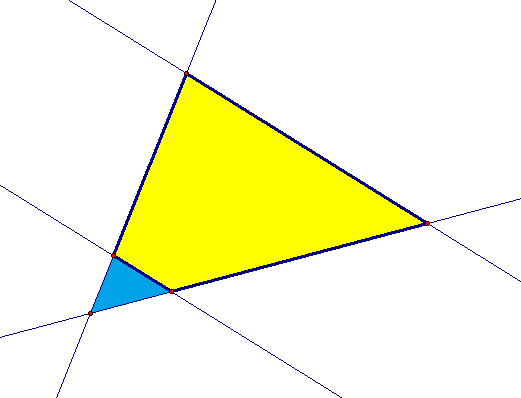 Extending the sides of any triangle creates no additional vertices, beyond the three which exist before the extension. This is a result of the fact that three is the maximum number of intersections created by three coplanar lines. 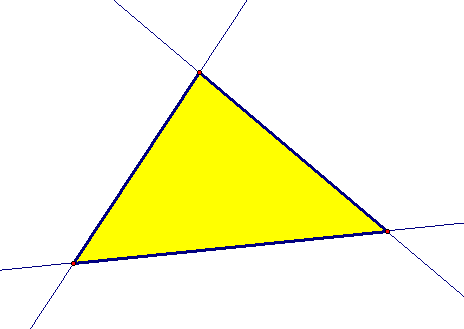 Three is, therefore, for triangles, the only answer. The next step: consider extended convex pentagons. I decided to start by maximizing the number of vertices, by having no parallel sides at all. 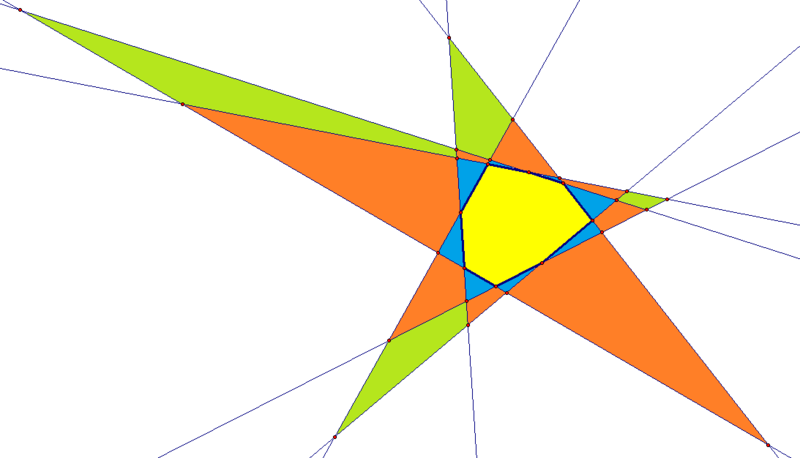 As you can see above, this produces ten vertices — five for the non-entended pentagon, plus five more formed by the entensions. To reduce this number, I simply moved vertices of the original, non-extended pentagon to eliminate external vertices, one at a time, by creating pairs of parallel sides. With one pair of parallel sides, as shown above, the number of vertices is reduced by one, from ten to nine. 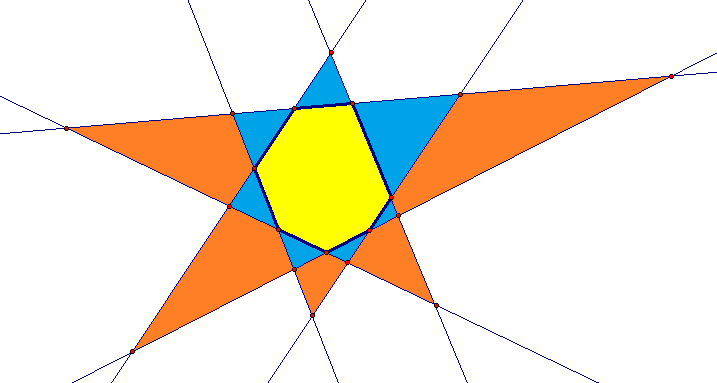 For pentagons, the maximum number of pairs of parallel sides is two, as shown above, which lowers the total number of vertices to eight. 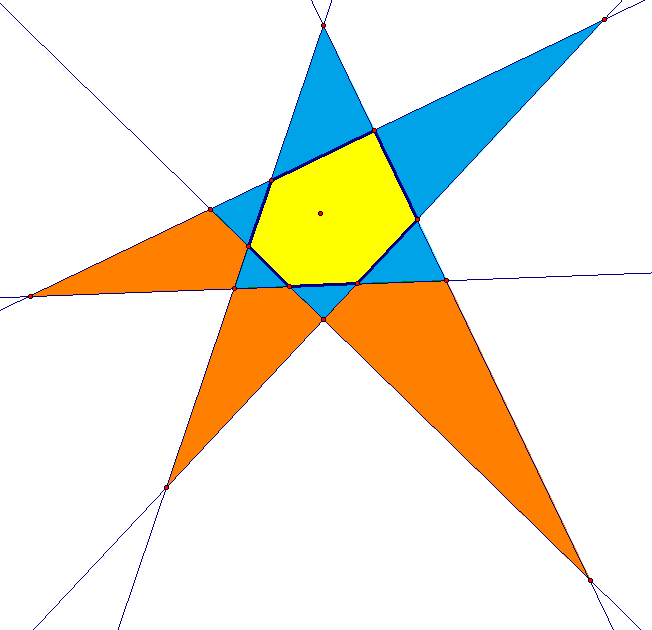 For pentagons, then, there are three solutions to this puzzle: 8, 9, and 10. The extended hexagon above has no parallel sides, which gives it the maximum number of vertices: fifteen. In the figure below, by contrast, there is one pair of parallel sides, reducing this number to fourteen. With two pairs of parallel sides, as shown above, this number again decreases by one, to thirteen. 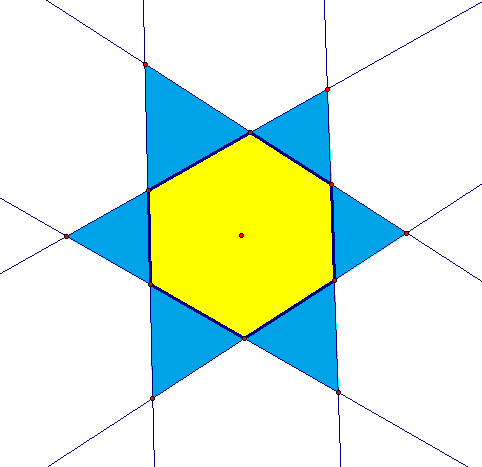 Three pairs of parallel sides is the maximum for hexagons, and is shown below; for this extended hexagon, there are twelve vertices. For hexagons, then, there are four solutions: 15, 14, 13, and 12. Still needing more data, I next investigated extended convex heptagons. With no parallel sides at all, as shown below, the total number of vertices is twenty-one. If only one pair of parallel sides exist, there is one less vertex than the previous answer gave, and this number is twenty, as shown above. 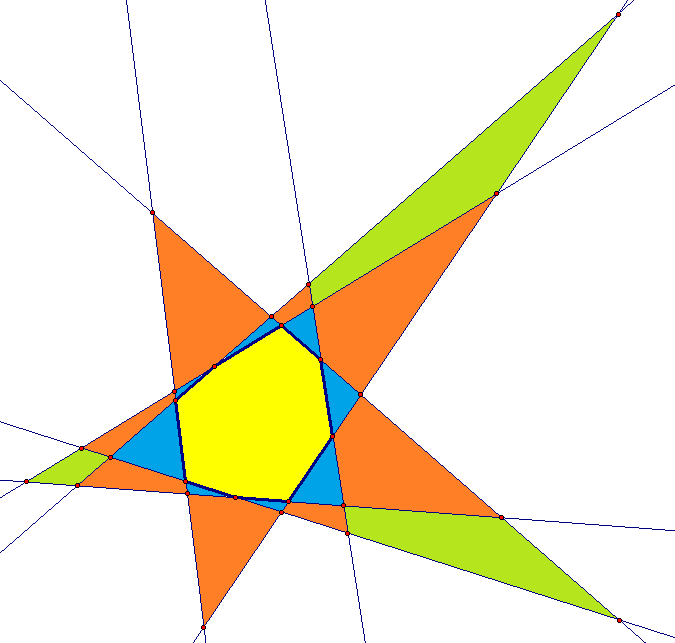 It is also possible for there to be two pairs of parallel sides, as shown below, and this yields nineteen vertices. 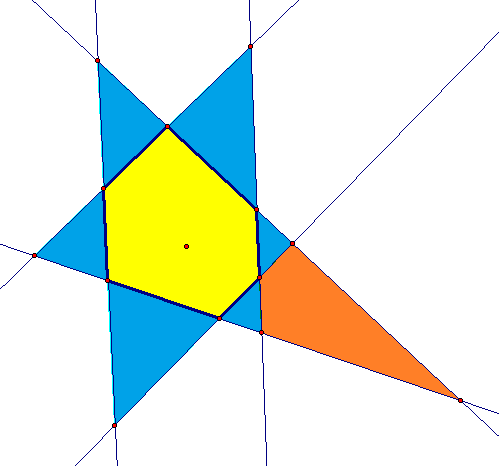 For heptagons, there is only one other option: three pairs of parallel sides. (A fourth pair would require eight sides.) This situation is shown below, and in it, there are eighteen vertices. 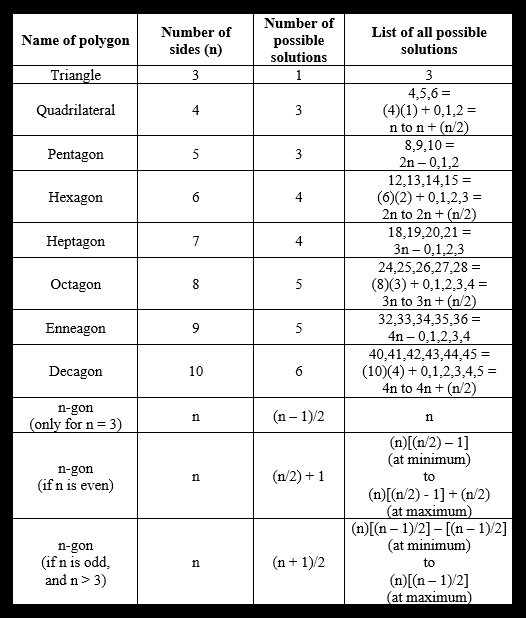 For heptagons, then, the solutions are four in number: 18, 19, 20, and 21. Next: octagons. With no sides parallel, to obtain the maximum number of vertices (as shown below), there are twenty-eight of them. In the diagram below, the solution immediately above is reduced by one, to twenty-seven, by making one pair of sides parallel. The next solution is shown below, and is twenty-six. This is accomplished by making two pair of sides parallel. To obtain twenty-five vertices, three pairs of sides are made to be parallel, as shown below. Finally, twenty-four vertices, the minimum for octagons, requires all four pairs of opposite sides to be parallel. This solution is shown below. Octagons, then, have five solutions: 24 to 28, inclusive. Here is the data gathered above, in the form of a table, along with additional data obtained by extrapolation, work shown toward a generalized solution, and then that generalized solution itself, in three parts: one for triangles, one where the number of sides is even, and one where n, the number of sides, is odd, with n > 3. Above is the entire figure, showing all three set of kites. The yellow set below, though, lie along the edges of a rhombic dodecahedron. The next set, the blue kites, lie along the edges of an octahedron. Finally, the red set of kites lies along the edges of a cube — the dual to the octahedron delineated by the blue kites. These images were made using Stella 4d, which is available here. The golden ratio, also known as φ, has a value of [1 + sqrt(5)]/2, or ~1.61803. It is associated with a great many figures in geometry, and also appears in numerous other contexts. The most well-known relationship between a geometric figure and the golden ratio is the golden rectangle, which has a length:width ratio equal to the golden ratio. An interesting property of the golden rectangle is that, if a square is removed from it, the remaining portion is simply a smaller golden rectangle — and this process can be continued without limit. While the golden ratio is related to many polyhedra, this relationship does not always involve golden rectangles, but sometimes it does. 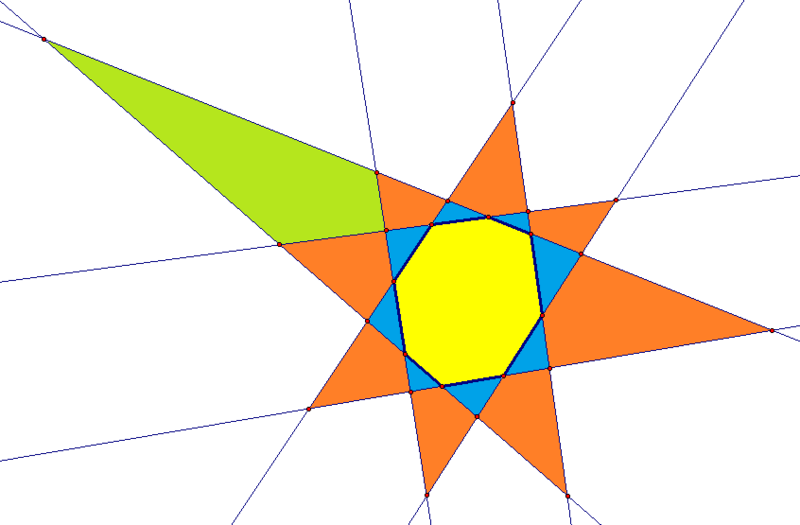 For example, it is possible to modify a rhombicosidodecahedron, by replacing that figure’s squares with golden rectangles (with the longest side adjacent to the triangles, not the pentagons), to obtain a “Zomeball” — the node which is at the heart of the Zometool ball-and-stick modeling system for polyhedra, and other phenomena. 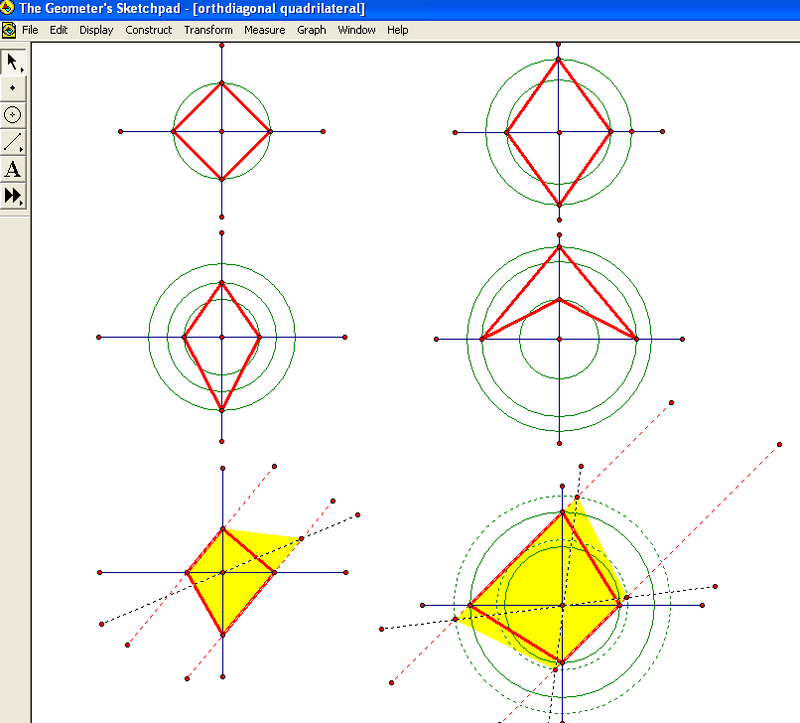 The entire Zome system is based on the golden ratio. Zome kits are available for purchase at http://www.zometool.com, and this image of a Zomeball was found at http://www.graphics.rwth-aachen.de/media/resource_images/zomeball.png. In addition to the golden rectangle, there are also other quadrilaterals related to the golden ratio. 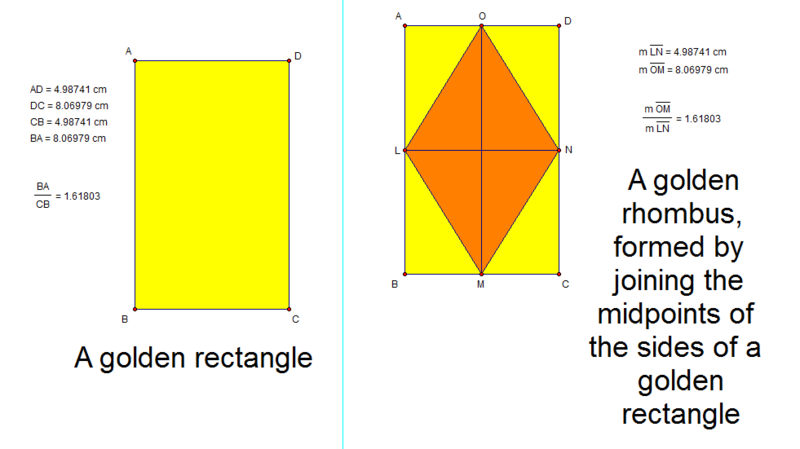 For example, a figure known as a golden rhombus is formed by simply connecting the midpoints of the sides of a golden rectangle. 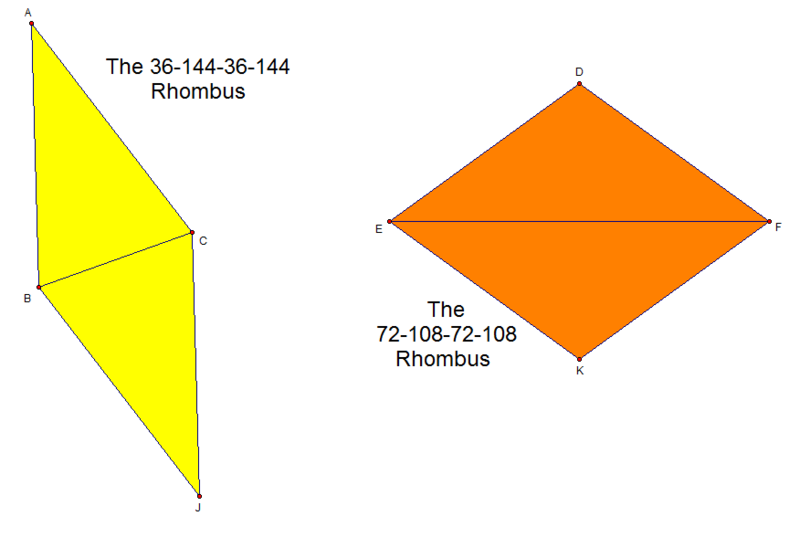 The resulting rhombus has diagonals which are in the golden ratio. 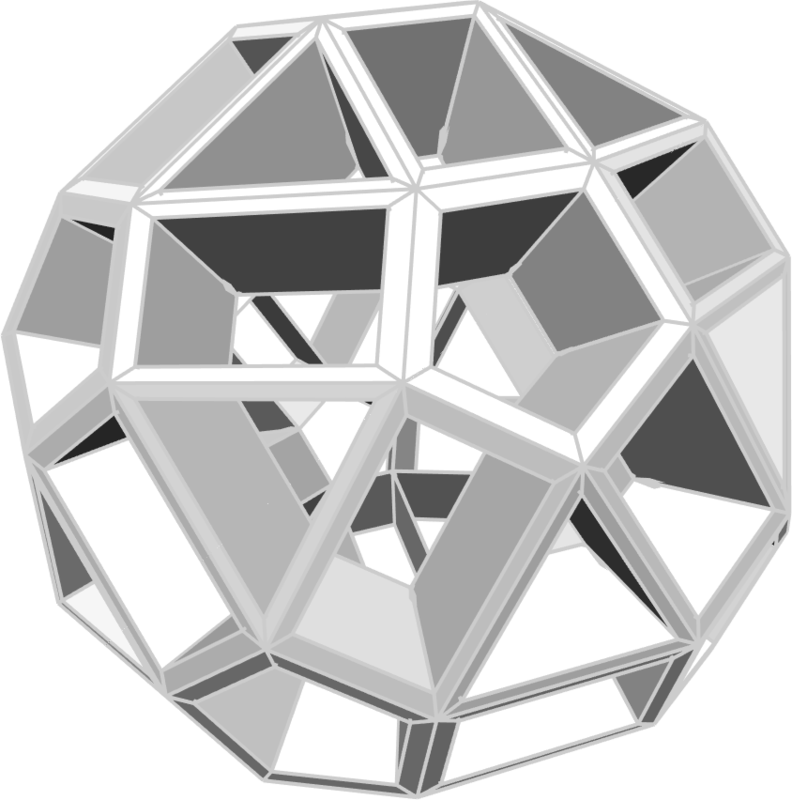 One of the Archimedean solids, the icosidodecahedron, has a dual called the rhombic triacontahedron. The rhombic triacontahedron has thirty faces, and all of them are golden rhombi. There are also other polyhedra which have golden rhombi for faces. One of them, called the rhombic hexacontahedron (or “hexecontahedron,” in some sources), is actually the 26th stellation of the rhombic triacontahedron, itself. It has sixty faces, all of which are golden rhombi. 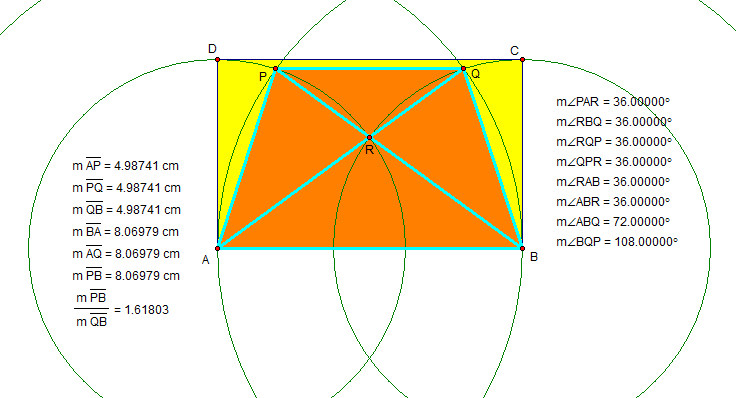 Other quadrilaterals related to the golden ratio can be formed by reflecting the golden triangle and golden gmonon (described in the post right before this one) across each of their bases, to form two other types of rhombus. 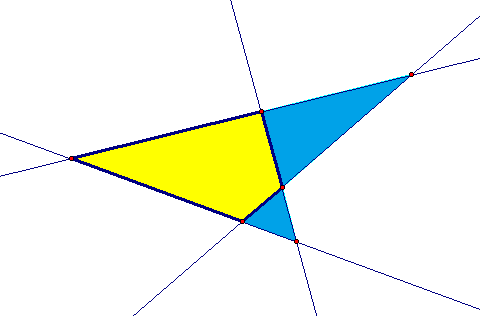 In these two rhombi, the golden ratio shows up as the side-to-short-diagonal ratio (in the case of the 36-144-36-144 rhombus), and the long-diagonal-to-side ratio (in the case of the 72-108-72-108 rhombus). 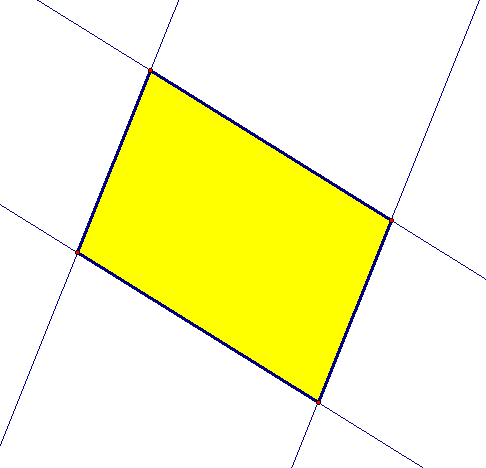 These two rhombi have a special property: together, they can tile a plane in a pattern which never repeats itself, but, despite this, can be continued indefinitely. 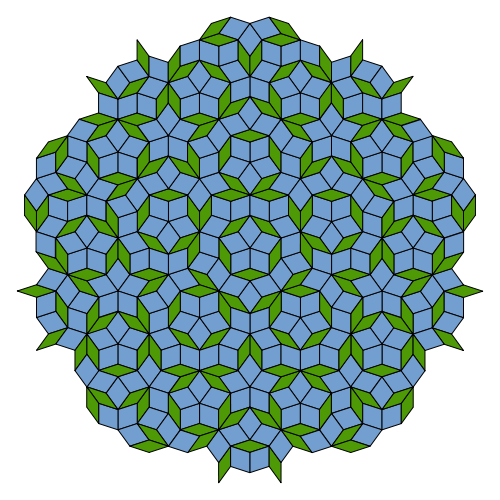 This “aperiodic tiling” was discovered by Roger Penrose, a physicist and mathematician. 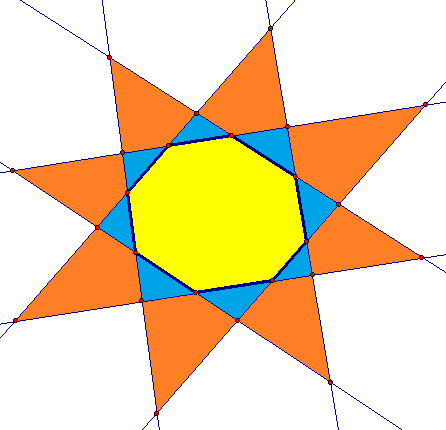 The image below, showing part of such an aperiodic tiling, was found at https://en.wikipedia.org/wiki/Penrose_tiling. There are also at least two other quadrilaterals related to the golden ratio, and they are also formed from the golden triangle and the golden gnomon. The procedure for making these figures, which could be called the “golden kite” and the “golden dart,” is similar to the one for making the rhombi for the Penrose tiling above, but has one difference: the two triangles are each reflected over a leg, rather than a base. 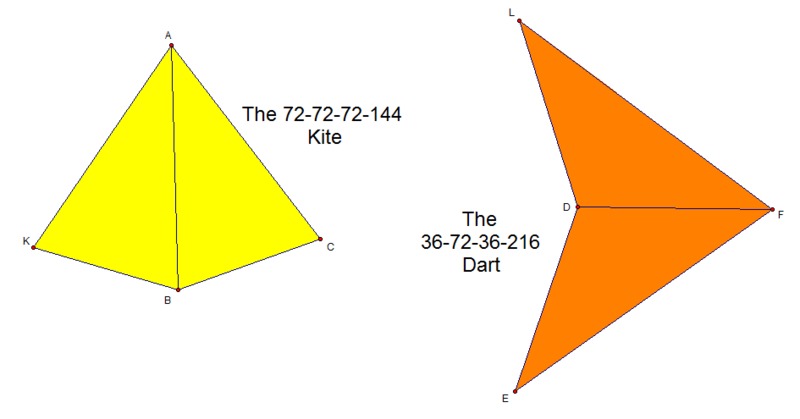 In the case of this kite and dart, it is the longer and shorter edges, in each case, which are in the golden ratio — just as is the case with the golden rectangle. 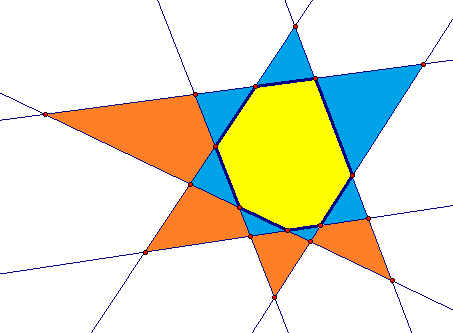 Another discovery of Roger Penrose is that these two figures, also, can be used to form aperiodic tilings of the plane, as seen in this image from http://www.math.uni-bielefeld.de/~gaehler/tilings/kitedart.html. 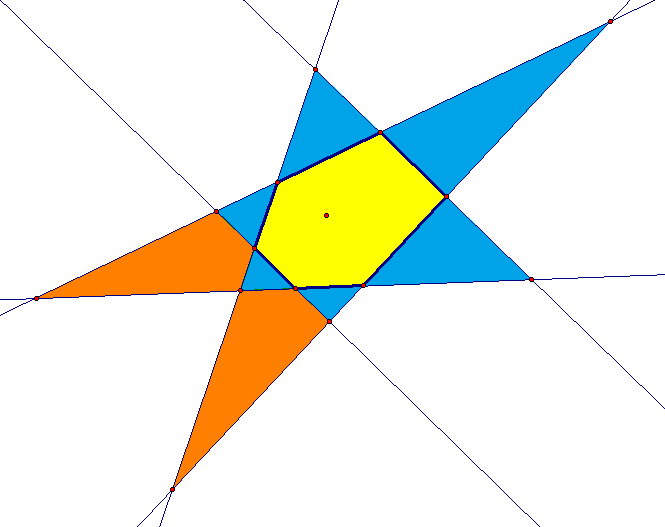 There is yet another quadrilateral which has strong connections to the golden ratio. I call it the golden trapezoid, and this shows how it can be made from a golden rectangle, and how it can be broken down into golden triangles and golden gnomons. However, I have not yet found an interesting polyhedron, not tiling pattern, based on golden trapezoids — but I have not finished my search, either. I just learned these things are officially called orthodiagonal quadrilaterals. I’ve been calling them Qw⊥Ds (pronounced “quids”) for years, have studied their properties, and have even tested students’ knowledge of Qw⊥D esoterica. Obviously, on grounds of symmetry alone, it is easy to determine that Qw⊥Ds include all squares. 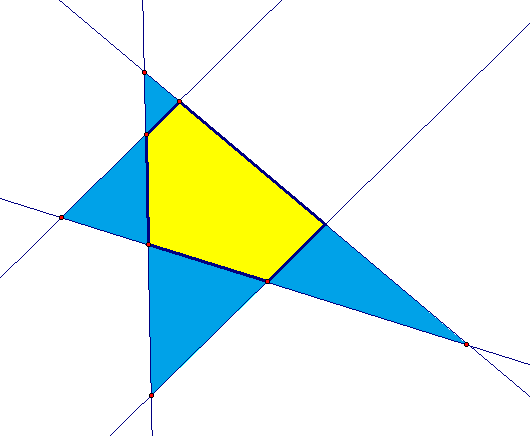 With congruent triangles, it is also possible to prove that all rhombi, kites, and darts are Qw⊥Ds. As for other parallelograms, such as the rectangle, they are Qw⊥Ds iff they are also rhombi. No non-rhomboidal parallelograms have perpendicular diagonals. With exactly one pair of parallel sides — what most Americans call “trapezoids” (that word has multiple, troublesome definitions) — things get more messy. 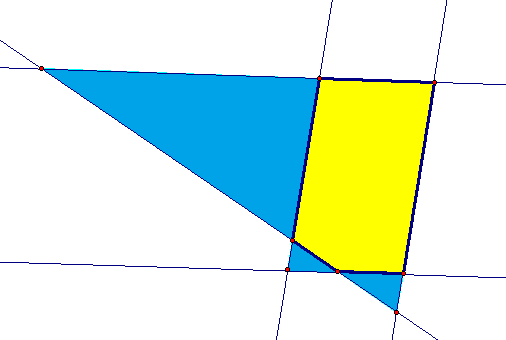 A non-isosceles trapezoid (lower left) can either have perpendicular diagonals (red) or not (yellow). As can be seen at the lower right, the same is true of isosceles trapezoids. This was created using Stella 4d, available at www.software3d.com/Stella.php. These polygons are known to virtually all speakers of English as the triangle and the quadrilateral, but that doesn’t mean I have to like that fact, and, the truth is, I don’t. Why? There are a couple of reasons, all involving lack of consistency with the established names of other polygons. In the case of the quadrilateral, the problem is twofold. The suffix “-lateral” refers to sides, not angles. For the sake of consistency, “-gon” should be used instead. The prefix “quadri-” does mean four, of course, but is derived from Latin, not Greek. We use the Greek prefix “tetra-” to refer to four when naming polyhedra (“tetrahedron”), so why not use it for polygons with four sides, also? 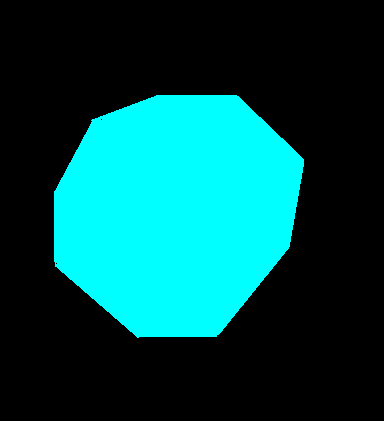 The best name available for four-sided polygons requires a change in both the prefix and suffix of the word, resulting in the name “tetragon” for the figure on the right. 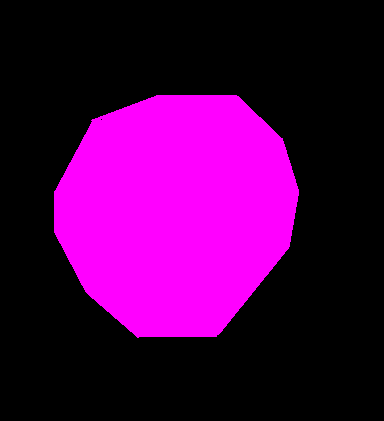 I don’t remember ever blogging about polygons with eleven sides, but I have told geometry students, in the past, that they are called “undecagons.” I won’t make that mistake again, for the derivation of that word, as is the case with “nonagon,” uses both Latin and Greek. A better name for the same figure, already in use, is “hendecagon,” and I’m joining the ranks of those who use that term, derived purely from Greek, effective immediately. With “hendecagon” and “enneagon,” I don’t think use of these better names will cause confusion, given that they are already used with considerable frequency. Unfortunately, that’s not the case with the little-used, relatively-unknown words “trigon” and “tetragon,” so I’ll still be using those more-familiar names I don’t like, just to avoid being asked “What’s a trigon?” or “What’s a tetragon?” repeatedly, for three- and four-sided polygons. Sometimes, I must concede, it is necessary to choose the lesser of two irritations. With “triangle” and “quadrilateral,” this is one of those times.